Chrichton's World: Review Spider-Man: Homecoming (2017): Not awesometacular but great coming of age drama! 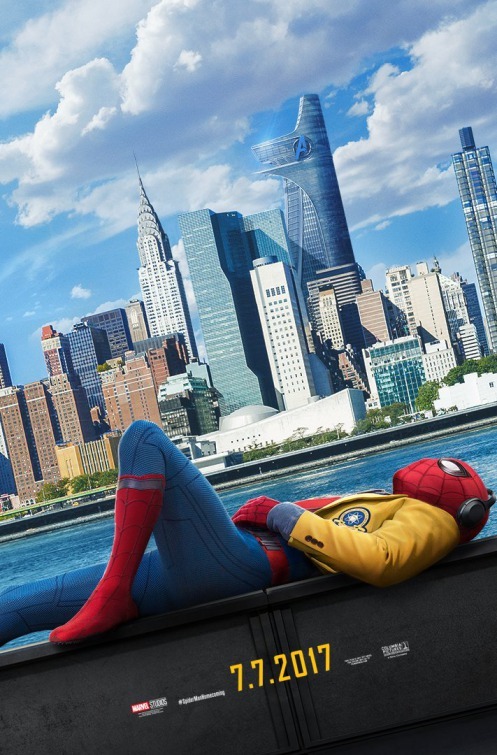 Review Spider-Man: Homecoming (2017): Not awesometacular but great coming of age drama! One thing you have to understand about Spider-Man: Homecoming is that it's one of the many smaller stories in the Marvel Universe that might not be as epic or grand but does have major consequences on a more personal level for Peter Parker. So if you were expecting more of the same action and spectacle from most Marvel movies you will be slightly disappointed. But don't worry there is enough of it to give you that action fix if that is what you are craving for. The new Spider-Man who we got introduced to in Captain America: Civil War returns and we learn more on what daily life is for him. Life as a high school student, nerd, and very ambitious crime fighter still learning the ropes of the trade. It's much smaller in scale but at the same time a pleasant difference compared to the supposed more adult issues the more mature heroes are dealing with. If you didn't like Tom Holland in Civil War I can guarantee you that you will definitely like him in this one. He is trying hard to do so many things but doesn't always succeed as intended. Now the film gives a very obvious reason for this which slightly contradicts his demeanor in Civil War. However one could look at his success as a taste of the skills and abilities Peter Parker can tap into eventually if he allows himself to learn from his mistakes and grow. I am naturally talking about inexperience and more than ever you will see our hero trying to do good and screwing up. So how does he deal with this? That is what you will find out. And for me personally that was truly satisfying. I must admit that I got a little worried at the beginning when the film was very moderately placed. However that was unwarranted since it redeemed itself many times over later in the film. One redeeming factor is Michael Keaton as the Vulture. He is a more human villain but at the same time also is capable of being calculated and coldblooded. Keaton is deliciously scary and evil. Yet he also shows that he is a man of character. Another good element in the film is the comedy. I found myself laughing at most of the jokes because they genuinely were clever and witty but also because I could relate to them. Everybody has experienced teen angst and you will instantly recognize it although considering how far they could take it Peter Parker is spared a considerable amount of drama and grief to keep things light. In the comic books Peter had to deal with a lot and it was one of the elements that made me like him more than other heroes since it made him more like everyman. But here they refer to that in the little speech Keaton is giving to Spider-Man which also made me respect the Vulture a tiny bit more. BTW when I say respect that does not mean that I condone or agree with his evil actions. Another good thing is that Spider-Man: Homecoming literally feels like Spider-Man returning to Marvel where he belongs. He is the one comic book character that got me reading and excited about many comic books which I am very grateful for. After the disastrous reboot Spider-Man I was convinced that Sony did not how to treat him right and was very happy to hear that Marvel got to use him again even if that means that they won't see a dime of the profits made. But if that doesn't show you how pivotal Spiderman is to the Marvel Universe then I don't know what will. That and the fact that Marvel will be able to use him in their own films and also can sell of all the kinds of merchandising Disney makes the big bucks on. I know you almost thought I forgot about the evil and greedy Disney. I won't ever. Although I do hope that Marvel will get him back for real since I don't ever want to see Sony with their dirty hands on my Spider-Man. Since Sony in my opinion don't even care about making good movies. I thoroughly enjoyed Spiderman: Homecoming and came out completely satisfied. Can't wait to get more of him in the other Marvel movies.